The difference between an emergency and an inconvenience is the level of preparation. 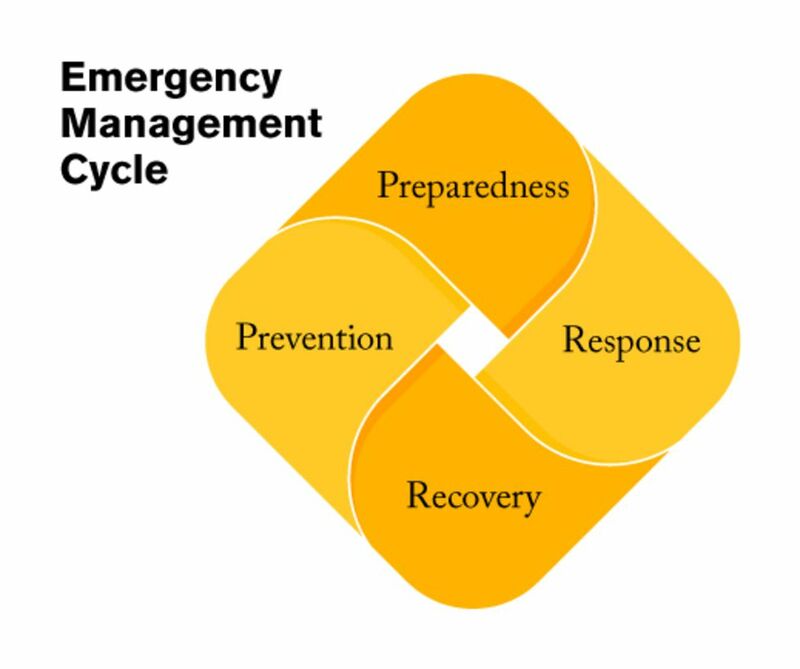 Emergency management planning improves the outcome of a disaster through proactivity. There are two main categories of disasters: natural, which are flooding, severe storms, health pandemics, etc. ; and human-caused, which are chemical spills, mass killers, water main breaks, train derailments, etc. Response: Efforts to save lives and minimize property damage, and efforts to make the bad stuff stop, if possible. Recovery: Getting life back to normal. Mitigation: Actions that are taken to reduce or eliminate long-term risks to people and property from this event, should it happen again. Planning and Preparedness: Determining how to improve response for the next time around, and ensuring that the improved tools to do so are in place. RRPC focuses mostly on planning and mitigation with communities (though we do have a hand in recovery during larger-scale events). This means we work with communities to identify vulnerabilities and then prioritize actions to eliminate or lessen the risk. It means arming people with information and training opportunities and providing platforms for information to be shared. It means creating opportunities to test and practice emergency plans. It means being a resource for towns so that the Rutland region can be stronger and more resilient. Local Emergency Management Directors, EMDs, and Coordinators, EMCs, play an important role in their communities—it’s also a state law that each municipality have an Emergency Management Director or Coordinator. The role of EMD defaults to the town’s executive officer if an EMD or EMC is not appointed. EMDs and EMCs oversee and spearhead planning and preparedness activities for their community, usually in coordination with the town manager or select board. During emergencies, EMDs and Cs are a critical link between the town and the outside world. RRPC understands that most EMDs and Cs are volunteers with many other responsibilities and obligations. We will work with you and your community leaders to identify and prioritize actions that make sense for your town. We’ll provide you with tools, templates, and expertise along the way so that you can do a great job. The best thing about being an EMD or EMC (other than the feel-good part about making a difference for your town) is that YOU’RE NOT ALONE! EMDs and EMCs come together from across Rutland County every other month for an EMD/C Roundtable. Roundtables are a platform to hear and share ideas, to learn about important topics and opportunities, and to plug in with others wearing the same hat. The experience of those at the table ranges from zero to twenty-plus years. There’s always something to learn from each other! Roundtables are held at RRPC’s office in Rutland City. Everyone is welcome to join, or to just sit in and feel it out—official EMD or EMC titles are not required. Check the bulletin board to find out when the next Roundtable is happening or email Steffanie to be put on the list. Local Emergency Management Plans are the most basic planning and preparedness tool for towns. The state requires each municipality to complete, adopt, and submit LEMPs annually after Town Meeting and before May 1. An electronic template is available on Vermont Emergency Management's website or by contacting RRPC. It’s important to carefully review the LEMP each year. Email addresses, phone numbers, and sites to be checked are all likely to change over time. There is a new format -- two formats, actually; one is "long" and the other is "short". Talk with Steffanie if you are not sure which is best for your community. The new format is a shift from the LEOP and we're here to help you through it! RRPC will work with towns to get the plan updated, answer questions, or connect information. Give Steffanie a call or send her an email—she’ll be happy to help! Mitigation is any action that reduces or eliminates long-term risks to people and property from disasters. Local Hazard Mitigation Plans, or LHMPs, are based on historical data and address vulnerable areas in a community that are likely to be impacted by natural hazards; and are a tool to identify cost-effective solutions that solve repetitive problems. LHMPs must be adopted by the municipality and approved by the state and by FEMA every five years. LHMPs prioritize greatest risks-- agreed upon by the public and by public officials—and where to focus resources. Solutions range in complexity from replacing undersized culverts, for example, to raising critical infrastructure above the floodplain. Having an LHMP makes towns eligible for grants such as the Hazard Mitigation Grant Program, Flood Mitigation Assistance, and the Pre-Disaster Mitigation Competitive Grant. RRPC has created a template and a streamlined process to help towns complete LHMPs and get them approved. Appoint an Emergency Management Director, Coordinator, or both (seriously, do both!). Update the Local Emergency Operations Plan (LEOP) every year. Complete a Local Hazard Mitigation Plan every five years. Adopt river corridor protection in land use bylaws and in town plans. Identify a local shelter for your community. Have written agreements in place with shelter partners. Keep supplies on site (bottled water, first aid kit, extra toilet paper, sanitation supplies). Check supplies and agreements annually. Put an emergency preparedness line item in the town budget (to pay for things like the stash of toilet paper, sandbags, or gas for the generator). Have mutual aid MOUs in place before they are needed. Review them annually. Engage residents! Use tools like Front Porch Forum, or a town newsletter to remind neighbors about shelter locations, family preparedness, and to keep them apprised of what your community is doing to be better prepared. State Watch Officer 1-800-347-0488 Resources and support beyond what is locally available. HazMat Hotline 1-800-641-5005 Resources and support beyond what is locally available. If your town sustains damage from an event it’s important to let RRPC know as soon as practicable. We send your town’s information—and info from all the other Rutland region towns— the state’s Watch Officer (or to the State’s Emergency Operations Center, if it’s activated). The state uses the information to direct resources to the areas that need it most and to determine if Vermont qualifies for a disaster declaration, which means access to federal dollars. Learn more about how much money your municipality could be reimbursed by federal and state governments at Vermont's Flood Ready website. Reports from towns give a snapshot of the scope and severity of an event from a boots-on-the-ground perspective. The state relies on Regional Planning Commissions throughout Vermont to be the voice of locals through local situation reports. Let us know as soon as practicable if your community sustains damage from an event. Also, let us know if your town is unharmed—this is equally important as sharing your damage information. We help make sure that the information from your town gets to the Vermont Emergency Management office and to other appropriate agencies such as VTrans and the Agency of Natural Resources. Sometimes the state will “activate” the Regional Planning Commissions if the state believes there could be a widespread impact from an event. RPCs then reach out to each town to collect local situation reports. We attempt to contact the people listed on each towns’ Local Emergency Operations Plan using a combination of VT-Alert, email, and phone. It’s important to document everything that you can during an event. Take pictures! Use a computer or a notebook to record the work done during response and recovery. Take more pictures! Record who did what, where, for how long, with what materials and why—for paid staff and for volunteers during response and recovery. Did we meantion take pitcures? Example: “August 29, 2011: Bob Jones, resident volunteer, cut and removed fallen tree limbs on Main Street from noon to 4:00 p.m. using the town’s chainsaw to clear the right-of-way for emergency vehicles”. Save time cards and receipts. Take pictures of the damage and debris, lots of pictures! Make sure the GPS feature in the camera is turned on if it has one, or make sure to record the exact location for each picture.